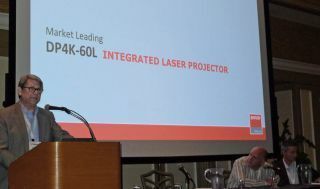 In something of a rematch of the ground-breaking session at the NAB Cinema Summit in April, “Laser Illuminated Projectors: What's New and When Will They Arrive?”, Monday’s Display Summit at InfoComm saw a special High Lumen Laser projection session, the “Digital Cinema Laser Battle” with the same companies squaring off– and with the same implications for all large venue projection not just cinema. But in slight shifting of chairs this time, the moderator was none other than digital cinema guru Michael Kargosian (perennially one of the key architects of the NAB Cinema Summit), with the NAB session’s moderator Bill Beck now wearing the Barco hat, while Christie’s Don Shaw and NEC’s Richard McPherson reprised their NAB shoot-out roles. But despite the slightly musical chairs– mainly the result of Bill Beck’s having just joined Barco literally days before the start of today’s Summit– the weapons brought to the game this time are the same– the most interesting new weapons in the video projection wars to appear on the scene in years– and deserving of a full airing for this InfoComm audience. Remember, this battle is not about “hybrid” laser/LED projectors that put out 1 to 7K lumens. We’re talking about huge milestones, with a single projector putting out up to 60K lumens or more.And with the projectors designed for smaller screens (NEC) cranking out 20K plus lumens. Bill Beck (at podium), who joined Barco only last week, represented Barco's Laser Projector offerings at the Laser Projector session at the Display Summit Monday, while (left to right, seated, Richard McPherson of NEC, and Don Shaw of Christie prepare to explain their companies Laser projectors. Don Shaw of Christie explained the advantages of the 6P laser setup, that allows for a 42-45% light efficiency (amount of light leaving the “lamp” that actually makes it through the 3D filtering to land on the screen). Shaw stuck to his two-projectors for 3D guns today, as Christie and Barco have been sparring fairly publicly for the several months over the one (Barco) vs. two (Christie) 3D configuration. And when NEC says their projector has a 20K hours lifespan, what that means is that after 20,000 hours, you still have 50% of brightness left. When Bill Beck of Barco, referring to different ratings floating around, asked Don Shaw of Christie, “is the Christie projector, 72K lumen, or 60K lumen?” Shaw replied "we’re saying 60K… but we can pump more…. I’ve seen systems with 100K lumens”. Shaw was confirming what all the big three manufacturers are doing: using a kind of sliding lumens output, depending on the need of the room, to get maximum efficiency not just max lumens. Barco, Christie, and NEC will no doubt be doing a combination of public and private showings of high lumen laser projectors at InfoComm in Las Vegas. If you have not seen one of these big guns, seek one out and be prepared to be amazed.